Participants will need to make their own travel arrangements to and from Rochester, NY. A limited number of travel grants are available to help defray travel costs. Part 2 of the application asks if you would like assistance with travel costs. 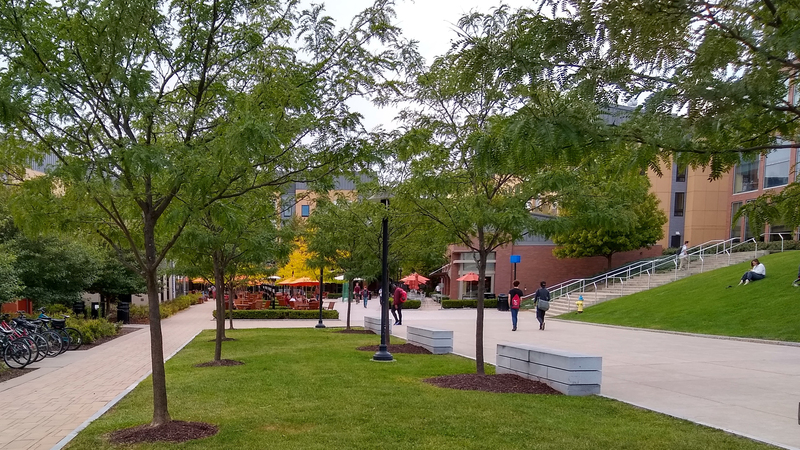 For students that drive to RIT, parking is available on campus. The Greater Rochester International Airport (ROC) is a 15 minute drive from RIT, and the most convenient airport for coming to Rochester. REU participants will live in at RIT's Global Village, a state-of-the-art global living experience and community. Each furnished suite contains five separate bedrooms, two bathrooms, and a common living area complete with kitchenette. Learn more about Global Village at their website here. Laundry Services Washer and dryer machines are available for use at no charge. You need to provide your own laundry detergent. Appliances The kitchenette does not include a microwave or coffee machine. Linens You will be provided with two flat sheets, two towels, one washcloth and one cotton blanket. You must bring your own pillow. Additional items Think of Global Village as your apartment for 9 weeks, so bring anything that you will need during that time. There are buses to transport you to local shopping centers and the mall so you can also purchase items once you arrive in Rochester. Participants have several options for purchasing food and meals on campus. For a list of campus restaurants, cafes, and food courts visit RIT Dining Services. Multiple grocery stores and shopping centers are located within 10 minutes from campus for students who prefer to use the kitchenette to prepare meals.